The restoration and operation of steam locomotives in our modern world is enabled by highly skilled professionals and fueled by funding from those who believe in the value of vintage machines. Project3713 has been fortunate to begin the year 2018 with some good news on the fundraising front. 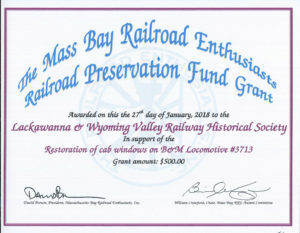 The Massachusetts Bay Railroad Enthusiasts, Inc. included Project3713 in their 2018 Railroad Preservation Fund Grant program which saw $12,500 go to deserving restorations. Project3713 received $500 towards the purchase of new cab glass. An all new cab is being built by Hopkins Manufacturing Company &Technology of Factoryville, PA and this grant ensures funding for the new windows. 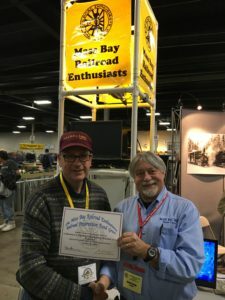 On January 27th, Mass Bay RRE President David W. Brown presented the grant to Project3713’s Norm Barrett during the Amherst Railroad Society’s big show in West Springfield, MA. We are grateful to the Mass Bay team for their support. As we look towards the balance of 2018, fundraising is top of mind. While work has been steadily progressing on the locomotive over the past two years, getting to steam-up is still dependent upon financial support. Donations are the most direct method off support, but there are other things you can do to help. If you are reading this on social media, please consider sharing amongst your friends and railroad-related groups. Help us spread the word. Finally, a reminder that you are invited not just to donate, but to participate. We have had a regular crew of volunteers helping out on #3713 in the Steamtown shop, and more hands are welcome. We will also once again host events this year where you can come out to meet other supporters of Project3713 and the team working on the locomotive.